"Empty buildings 'could provide shelter', says homeless charity boss"
"The head of a homeless charity in Northern Ireland has called for owners of vacant buildings to consider making them available for those sleeping rough during winter cold snaps." 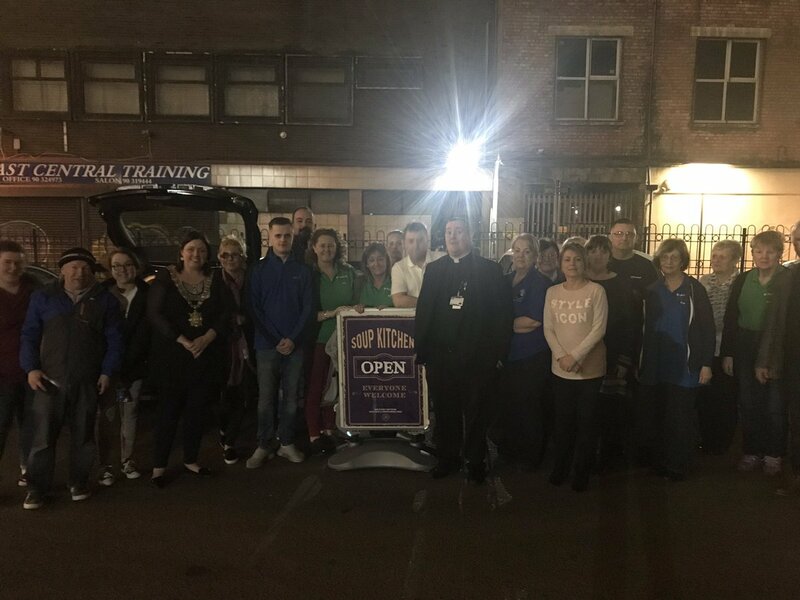 Shelter NI director Tony McQuillan also urged Belfast City Council to think about installing a large tent and heaters in the grounds of City Hall to protect the most vulnerable people. Mr McQuillan said the problem of homelessness can't be ignored. "It is not good enough to say there is space available in homeless hostels and then turn a blind eye," he said. "We need to be more creative in how we reach out." Mr McQuillan recalled the public outrage expressed after the tragic deaths of five homeless people in a seven-week period at the beginning of 2016, which he said seemed to motivate government departments into action. "Much of that never materialised and now we don't even have a government - sadly more people will inevitably die as a result," he added. He described encountering destitute people who are "too frightened" to stay in hostels due to the nature of the environment, which can involve violence and drugs. "If someone has a building that they don't mind being used on a temporary basis, then they should approach one of the many charities or statutory agencies trying to tackle this issue," he added. "I think people who avoid hostels would be persuaded to come and stay somewhere warm if it was adequately staffed and managed responsibly." "There's no reason why the grounds of City Hall cannot be transformed into a heated shelter during particularly cold weather." Two other homeless charities said they would support the plan which could protect people from hypothermia - if managed by specialist staff and volunteers. 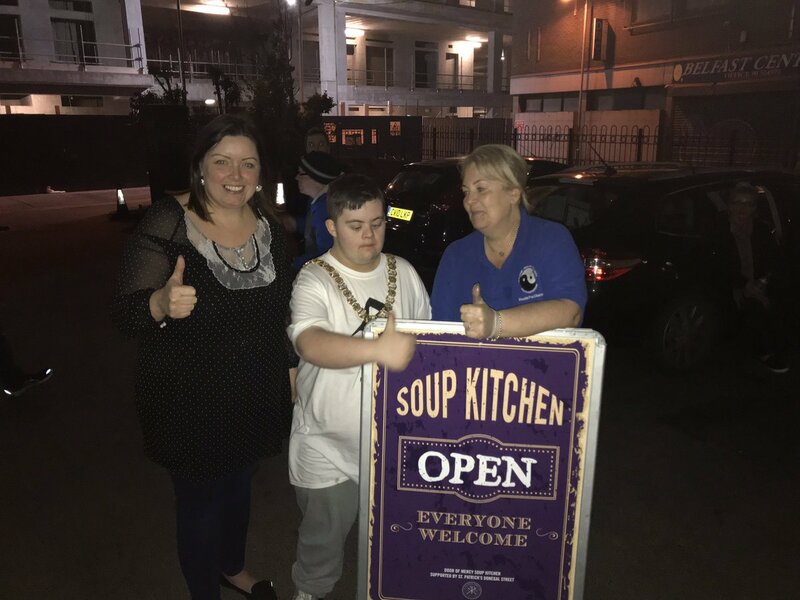 Sandra Moore, the chief executive of the Welcome Organisation, recalled how she once persuaded seven people to attend the organisation's drop-in zone the last time hours were extended due to freezing conditions. But she warned there must also be a focus on coming up with long-term solutions and called for a better co-ordinated multi-agency response. "Welfare reform and a housing crisis have created a perfect storm for homelessness and we expect it to get worse when the mitigating funding for Universal Credit is no longer available," she said. The Simon Community's director of homelessness services, Kevin Bailey, also expressed his support but warned it is a short-term fix for a complex problem made worse by welfare reform, the absence of a functioning Assembly and an "ongoing housing crisis" in Northern Ireland. "A significant number of our tenants are ready to move on but cannot access the housing market - a shortage of housing is forcing people into private rentals which is driving up prices. "Too many people find it unaffordable and inaccessible." 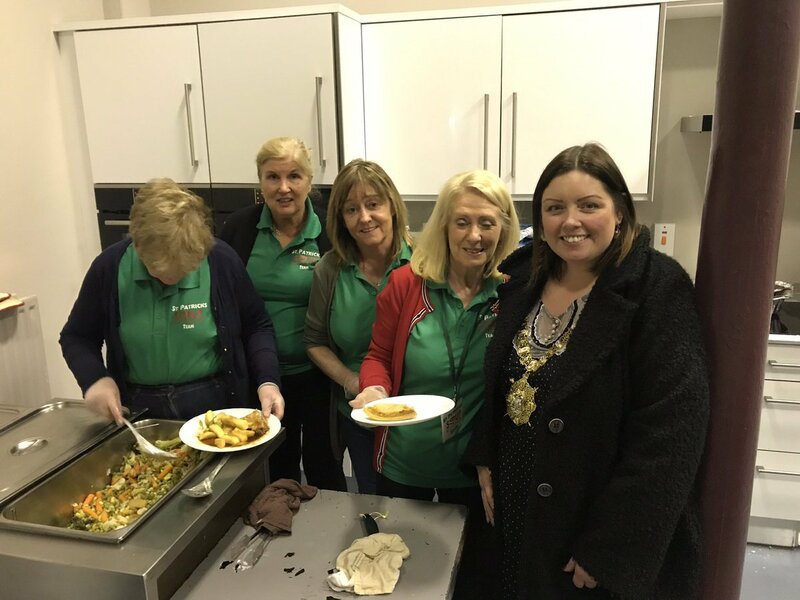 Belfast City Council said Lord Mayor Deirdre Hargey chairs regular meetings with statutory and voluntary partners to "develop and progress a co-ordinated approach in tackling homelessness" and that any request to use its facilities should be made through the proper channels. The Department for Communities, which oversees the benefits system here, said it has no evidence that welfare reform is a factor in why people end up homeless. "8th December 2018" "Huge thanks to all the staff and customers of Sainsburys across NI for fundraising and donating to Welcome during their annual Moment In Time." These people are living saints. Leave nothing but footprints, take nothing but pictures, keep nothing but memories. "Can you lend a helping hand? 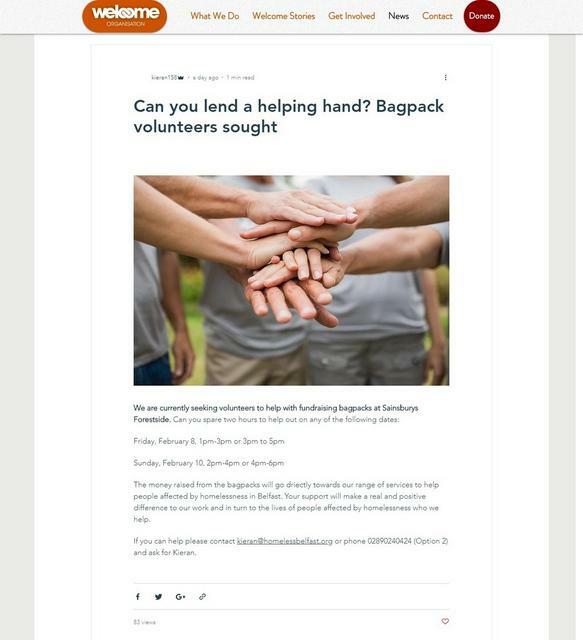 Bagpack volunteers sought"
"If you can help please contact [email protected] or phone 02890240424 (Option 2) and ask for Kieran." "Can you spare two hours to help out on any of the following dates:"
This section of the forum can be viewed by people who aren't signed up to or logged in to the forum,... so if you want to mention the information in the post above on any other sites that you post to, you can do that by posting the link to that post, in either of the forms below. it is awful and very sad. .
blessed is the fruit of thy womb Jesus. Holy Mary mother of God, pray for us sinners now and at the hour of Our death . AMEN. There's been another death on the streets, on 15th February. "The death of a man in his 20s on the streets of Belfast has devastated the homeless community, with some of them telling outreach workers they could be next." "The young man’s body was found in the Keylands Place area of the city centre, between Brunswick Street and Great Victoria Street, on Friday." "It was nice to see the seniors at Flax Day Centre today who raised £200 to support our work at the soup kitchen. They made jars and sold them to raise the funds. Thank you ladies."